S4SD – Don’t Be Distracted! WOAS-FM 88.5 and the Ontonagon Area Schools Senior Service Project class will be teaming up in February 2016 to conduct a driving safety campaign called DON’T BE DISTRACTED. The program will be aimed a students in grades 6 throught 12. 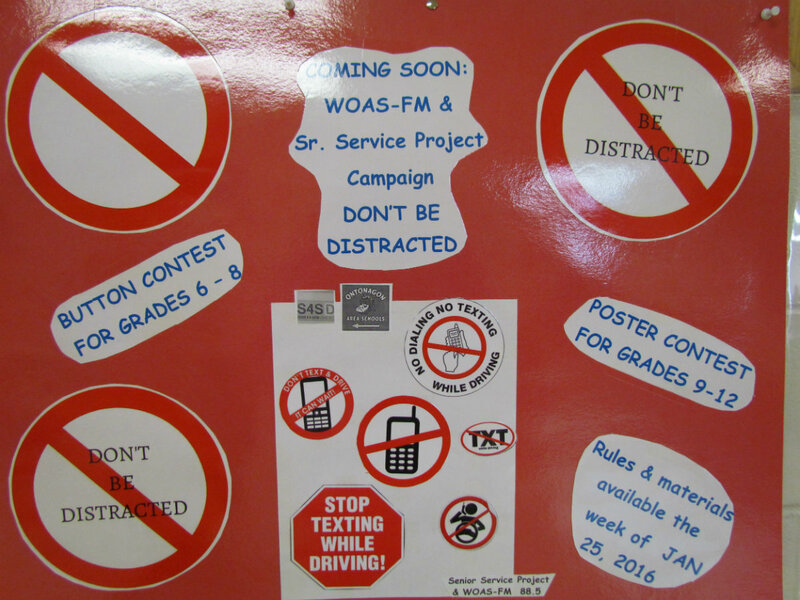 SSP and WOAS volunteers will be conducting a survey to gauge our students level of awareness of the distracted driving problem. They will also be conducting a button contest for grades 6 – 8 and a poster contest for grades 9 – 12. Winning entries in each grade level will receive a $25 gift certificate from Peninsula Graphics in Ontonagon. Michigan State Trooper Jerry Mazurek, an Ontonagon grad, will be giving a talk on distracted driving to our students in March. The campaign is being funded with a grant from the Strive 4 a Safe Drive (S4SD) program sponsored by the State of Michigan and Ford Motor Co. The student body will be introduced to the project during the end of January with all button and poster entries due by the end of February 2016. Paul McCartney has not officially endorsed the Don’t Be Distracted campaign, but we are pretty sure he would think it is worthy of his musical contribution!